Win a custom 3D printed Assassin’s Creed Unity figure! We’ve told you before about Assassin’s Creed Unity’s shiny new custom character creator. It’s a little limited in scope, sure, but the neat thing about it is that your custom Arno could end up being featured in the next big trailer for the latest game in the Assassin’s Creed lineage. We might be able to fast track that… also, you could be in the running to win a custom, 3D-printed version of your Assassin. Here’s how it works. 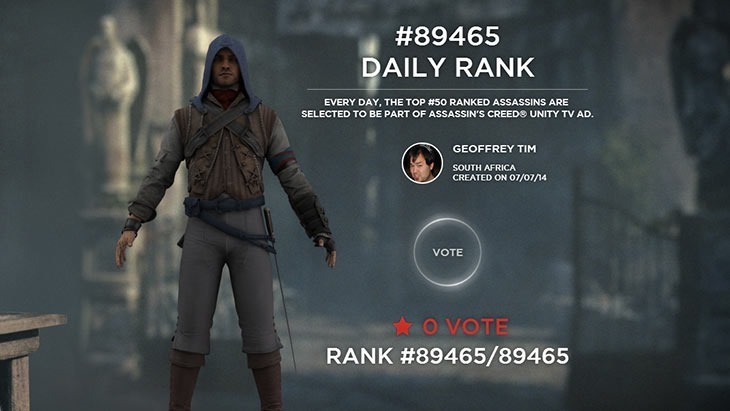 You head on over to the assassin customization platform on www.acunity-unite.com and start customizing your own Arno. You’ll then have to save your Arno, and publish him to Facebook. Once you’ve done that, share that link to your custom Assassin and drop that link in the comments, by July 20 2014. From the entries, we’ll select our two favourites, which we’ll then send off to Ubisoft. Those two will each have their assassins featured in the trailer. Another media house from a different region will do the same, and Ubisoft will will select a winner from those four entries; that final winner will be the lucky sod who gets a one-of-a-kind, wholly unique 3D printed replica of their custom Assassin. Here’s the bland one I whipped up in about 14 seconds flat this morning. I call him Captain l’idiot pantalon gris. He’s currently ranked dead last of all the assassins made today. I rule. So go off, make your own… and share them here. Please do better than I did. Create a rad Arno, and you could own him. Neat. Oh yes..you must live within South Africa to enter this. Sorry. Previous article Tired of defending in Dota 2? Play these mods instead!